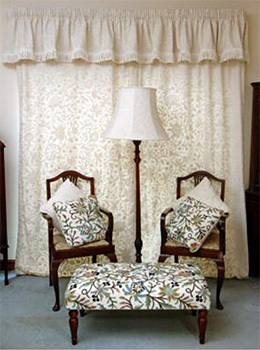 At Coromandel, we commission our crewel embroidered fabric in designs and colours to reflect its early English heritage from Tudor and Jacobean times. With reference to recurring historic motifs in tapestries of the 16th and 17th centuries and paintings of the Renaissance, we aim to produce authentic fabrics with character, made using similar artisan methods to those used at the time. Over 35 years we have sourced the best possible materials and researched techniques and colours to create truly iconic fabrics of outstanding quality. Our choice of the most appropriate colours and subtle tones has evolved to feature those most suitable for use in homes and establishments ranging from 16th century cottages and castles to Edwardian townhouses and boutique hotels. 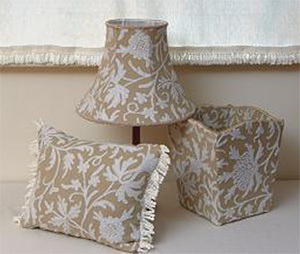 Our fabrics are now recognised as being some of the finest quality hand-embroidered crewels available and are increasingly sought after, both here and abroad. Produced to our own specification in limited batches of only 250m of each design at a time, Coromandel fabrics usually take up to five months to make from commission to completion. Because we use artisan methods, do not buy ‘off the peg’, and need our designs to be faithfully reproduced; each and every design and colour must be meticulously copied metre by metre to recreate a fabric as close as possible in both pattern and tone to the previous batch. Inevitably, this is harder, more time consuming and more expensive than producing an ‘off the peg’ fabric on a machined background and featuring any design and colours available to hand, which is how many fabrics produced only for the retail market can be made more cheaply. Most crewels are valued according to the overall weight, the quality of work and materials and the number of stitches involved and some of our designs feature nearly 130,000 stitches per metre which can be three or four times as many as those on apparently similar fabrics. Our upholstery-weight background cloth is loomed by hand, using the best quality available cotton and taking over 15 hours of work to complete each 10m length of fabric. Once loomed, the fabric is washed and dried before it can be embroidered upon. The design is then hand-stencilled onto the background cloth, whilst the highest grade 2 ply wool is dyed in the separate colours required for the embroidery. As the multicoloured fabrics in our Heritage Collection feature as many as 14 different shades of colour, the dyeing process for the wool needed for a single design may take up to 28 hours and then another 24 hours is required to allow the wool to dry before it can be used. When ready, the design is embroidered entirely by hand and, to add to the unique nature of the fabric, we encourage our artisans to initial their work in embroidery if they wish. Between 97200 and 129600 stitches per metre are required for each of our designs and embroidering a single metre takes between 5 and 7 days, even by our most skilled embroiderers. The fabric is then washed, stretched, dried and folded before being transported over 3 days by land for shipment to the UK.